Saint Athanasius provides an articulate argument in response to the Modalist and Doecetic theologies for the incarnate Word of God by explaining a more responsible interpretation of the trinity. He explains that humans have experienced a “corruption proper to their nature,” leaving them “bereft of the grace which belongs to them as creatures in the image of God” (p.33). God has a responsibility to restore our “lost existence” for “evil is non-being” (p.30). He argues that because God made man, He must “make death disappear from them as utterly as straw from fire” (p. 34). Not saving man would negate God’s reasoning for having made them in the first place. In order to solve this problem God “assumed a body capable of death…[who] might become in dying a sufficient exchange for all…put an end to corruption for all others as well, by the grace of the resurrection” (p. 35). Athanasius argues that Jesus became a man who “was both born and manifested in a human body…as an embodied spirit” (p.29). To remain orthodox and avoid Gnosticism, namely the understanding that the body is not essential to the person, we must ask if Athanasius is using Gnostic language. Can Jesus be described as an “embodied spirit,” and at the same time have a body as essential to his person? This question is left unanswered in this text, but he continuously refers to God being “made manifest” in a human body (p.57, 71). Athanasius is not focused on whether or not the body is essential to the person. His primary focus, rather, is that the Word became man in the same essence as man (p. 43). Athanasius aims to prove this to the Jews and Gentiles alike by the miracles of Jesus (p.47). He takes considerable time discussing the public and violent nature of Jesus’ death (p.51). Death is not in God’s nature, but in the nature of man. 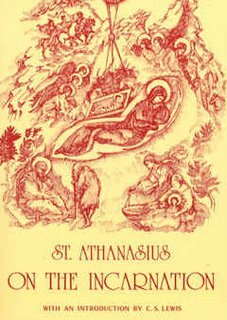 Athanasius suggests that the primary purpose of Jesus’ life was his death “because it was precisely in order to die that he had taken a body” (p.51). I would part with Athanasius on this point: God may understand why Jesus had to die, but if we are to argue for Jesus’ humanity, we must understand that He understood his vocation but not necessarily his death. Jesus may have been able to foresee his crucifixion by understanding the dangerous nature of his vocation but not by some divine knowledge lest He lose his humanity. Athanasius may have misunderstood Jesus’ own understanding of his purpose as a human being while preserving Jesus role in the Godhead. He argues to the Jews from their own scriptures which “are not silent even about his death” (p.65). He brings messianic literature to the attention of his readers. “Surely then it must be plain even to the most shameless that the Christ has come, and that He has enlightened all men everywhere, and given them the true and divine teaching about His Father” (p.75). To the Greeks he argues differently. His argument is that Jesus cannot just be a man, He must also be Divine. By process of elimination He brings us to the conclusion that Jesus can be nothing less that Yahweh Himself in a human body (p.86). He can’t be a mere man, He can’t be a magician, or a “daemon” He must be God (p. 86). His works are “truly the works of God” (87). He also brings up a challenge: “As, then, he who desires to see God Who by nature is invisible and not to be beheld, may yet perceive and know Him through His works, so too let him who does not see Christ with his understanding at least consider Him in His bodily works and test whether they be of man or God” (p. 92). He cannot be merely a man, He must be God Himself. Athanasius affirms the Nicene Creed. His argument is monumental in the Church’s ability to explain this very mysterious and elusive doctrine of the Trinity. Christ has been manifest as human and yet divine – sharing in oneness with God yet being a different person. It is a paradox of the Christian faith – Jesus is God and Man, One yet separate. Modalism suggests that Son of God and God the Father are the same “person” revealed with different “masks.” Docetism suggests that Jesus was God and merely appeared to be human. See Henry Bettenson & Chris Maunder, Documents of the Christian Faith (New York: Oxford 1999) 28. Wes I'm totally writting a paper on the same book right now. I loved this book, St Athenasius was a brilliant man.